Tektronix, one of the leading providers of test, measurement and monitoring instrumentation, has introduced availability of the MSO4000 Mixed Signal Oscilloscopes (MSO). The new MSO4000 family of mixed signal oscilloscopes combine three strong capabilities, an advanced real-time oscilloscope and logic analyser, and the Wave Inspector waveform search engine into one small and lightweight portable device for embedded design and debug. The MSO4000 provides a familiar oscilloscope front-panel and a stunning display, letting the engineer control everything intuitively but with only a fraction of the size and weight of other MSOs. The MSO4000 ushers in a new level for performance and usability, providing debug functionality that raises the bar for mixed signal oscilloscopes to a high level yet. Embedded systems are literally everywhere. Examples include cellular phones, automotive systems, avionics, network devices, industrial controls, and consumer electronics. Debugging an embedded design often requires viewing analogue signal phenomena and the interaction of digital control signals. In this mixed signal environment, engineers cannot accurately predict the types of problems that will be uncovered during development. They need a test instrument with the ability to acquire both analogue and digital signals and display them time-correlated on a single display. The new Tektronix MSO4000 combines leading oscilloscope and basic logic analyser capabilities so that engineers can conveniently visualise and correlate analogue and digital signals on a single instrument. According to Tektronix, embedded system designers are often working with both analogue and digital signals in their designs and need strong yet easy-to-use test tools for both. The new MSO4000 provides fully featured analogue and digital channels, long-record length on all channels, strong productivity tools including large display, Wave Inspector, and a good performance. With many features beyond any MSO in the market, the MSO4000 series simplifies operation, ensures measurement confidence and are ideal for engineers needing to more efficiently design, debug, and test their embedded designs. According to Garmin AT, having both digital and analogue channels and being able to see these together on the same large display makes the Tektronix MSO4000 ideal for the type of work it does with aviation applications. What is going on inside the components can be seen with test points on the device under test tied to the Tektronix MSO scope. What is tried and done in simulations can be done in the real world. The features provided by this scope have made jobs easier. The Tektronix MSO4000 is one of the useful pieces of test equipment Garmin AT has had. 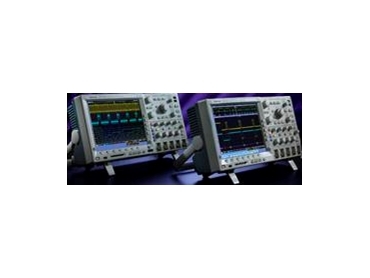 The MSO4000 oscilloscope family consists of four models ranging from 350 MHz to 1 GHz, with two or four analogue channels and 16 digital channels to provide up to 20 time-correlated channels. The MSO4032 and MSO4034 provide bandwidth of 350 MHz on two and four analogue channels respectively. The MSO4054 provides 500 MHz bandwidth across four analogue channels and the MSO4104 provides 1 GHz bandwidth on the four analogue channels. The MSO4104 provides 5 GS/s sampling on all channels while the other models provide 2.5 GS/s on all channels. All models come standard with 10M record length on all analogue and digital channels. The MSO4000 provides two methods for capturing digital waveform data. The main digital acquisition mode captures 10M points at 500 MS/s (2 ns resolution). The MSO4000 also provides MagniVu ultra high resolution signal acquisition technology that acquires 10,000 points at up to 16.5 GS/s (60.6 ps resolution). Both the main and MagniVu waveforms are acquired on every trigger and can be viewed at any time, running or stopped. MagniVu provides more than eight times faster timing resolution than any other MSO on the market, instilling confidence when making critical timing measurements on digital channels. According to Micron Technology, by combining good oscilloscope capabilities with basic logic analyser features in the same time domain, the portable Tektronix MSO4000 addresses its needs for design verification and test. The MSO4000 provides familiar oscilloscope operation, gives Micron the full system big picture on one screen and meets its system development needs for NAND Flash memory used in many embedded designs. The fine resolution afforded by MagniVu has been a real asset in finding difficult to discover problems. The MSO4000 enables the engineering team at Micron Technology to more quickly find and solve problems. The MSO4000 provides the Wave Inspector on all analogue and digital channels, a set of easy-to-use tools for discovery and efficient viewing, navigating, and analysing waveform data. Managing up to 20 channels, each with 10M record length, has been simplified through automated waveform pan and zoom, user definable markers and intelligent search and find modes. All MSO4000 models provide a 10.4 inch, XGA color display, a large and high resolution display in its class. Not only is the MSO4000 a capable oscilloscope in its segment of the market, at only 5.4 inches deep the MSO4000 is shallow on the market, requiring less bench space than competing products and weighs only 11 pounds for easy portability. The MSO4000 combines good specifications, familiar operation, innovative troubleshooting capabilities, and comprehensive support for monitoring, triggering, and decoding parallel buses and common serial buses used in embedded design such as I2C, SPI, CAN, and RS-232. The ability to decode buses, including parallel buses and RS232 signals, combined with the event viewer in the MSO4000 oscilloscope, is a help in debugging circuits. These tools take care of the tedious work of decoding the bus manually and searching through the data to find the event in question. This means less time searching for the problem, leading to quicker solutions. Along with the new MSO4000 oscilloscopes, Tektronix is introducing the P6516 digital probe. This unique probe design provides two eight channel pods that can each probe parts up to eight feet apart, facilitating the reach to multiple areas on a board with a single probe. Colour-coding of the leads correlates the probe tips to the signal trace on the display. The sleek P6516 probe leads do not get tangled, making connecting to the device under test simple. One P6516 probe is included with each MSO4000 model purchased. All MSO4000 models are available for purchase and delivery now. Tektronix products are available from TekMark.